For sale under construction 3 bedroom triplex penthouse with roof garden. The apartment has 175sqm covered areas, 40sqm covered verandas and 68sqm uncovered verandas. 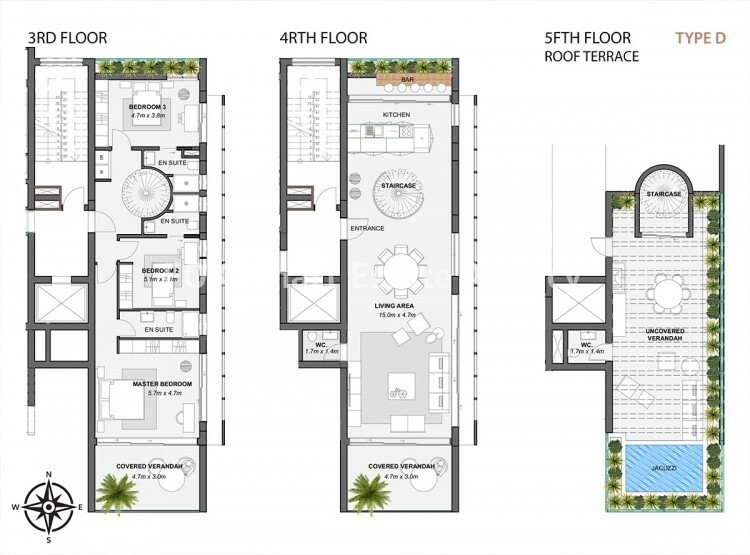 On the 3rd floor is the living/dining area, a guest wc and an open plan kitchen. On the 4th floor is the master bedroom en suite and another two bedrooms all en suite. The roof garden consists from the Jacuzzi and one bathroom. The apartment has 2 parking spaces and a store room. The building offers a definitive contemporary setting for the sophisticated modern lifestyle and the need to balance work and home, pleasure and leisure, activity and tranquility. For each apartment, space heating uses water under floor heating to provide superior all around comfort and minimize energy running costs. All apartments are fitted with VRV Air Conditioning and discreet ducting, buried within the walls/ceilings. The properties are fitted with panelled security doors, Video Intercom and door access controls for visitor access. A CAT 6A voice and data structured cabling system is provided as well as a master TV antenna, fire alarm and burglar alarm.